The Greek contribution to the first Global Science Opera was built around the concept of promoting the inclusion of remote educational communities, the composition of original music and the participation of both teachers and pupils at the performance. The Greek skyscene video-participation was composed and produced by Petros Stergiopoulos on behalf of Ellinogermaniki Agogi. In the 3rd scene of the 1st Act, Joao and his father are having a conversation concerning the "Formation of Stars". Joao asks crucial questions about the collision of galaxies and the heat produced. His father answers the questions as simple as possible but Joao insists. As Joao asks about heat he considers the heat of our Sun as the only sense of measure to understand its power. The moment Joao asks: "how much heat? ", he remembers the myth of Icarus who burned his wings seeking for freedom as he was flying away from Crete towards the Sun with his father Daedalus. "In Greek mythology, Icarus (the Latin spelling, conventionally adopted in English; Ancient Greek: Ἴκαρος, Íkaros, Etruscan: Vikare) is the son of the master craftsman Daedalus, the creator of the Labyrinth. Often depicted in art, Icarus and his father attempt to escape from Crete by means of wings that his father constructed from feathers and wax. Icarus's father warns him first of complacency and then of hubris, asking that he fly neither too low nor too high, so the sea's dampness would not clog his wings or the sun's heat melt them. Icarus ignored his father's instructions not to fly too close to the sun, whereupon the wax in his wings melted and he fell into the sea. This tragic theme of failure at the hands of hubris contains similarities to that of Phaëthon." The music score for the "Formation of Stars" was originaly composed for full String Orchestra, Tympani, Voice and Violoncello. A sequence of intervals played by the first violins opens the introduction. The sequence is doubled by second violins as the theme progresses towards the "question of heat". The beam of light (ακτίνα/χορδή φωτός) was symbolized by the soprano voice of Dr. Katerina Boulakou , echoed by the violoncello of Antonis Kontopoulos (3rd grade High School student, Ellinogermaniki Agogi). The piece expresses a lyrical lament for the rise and fall of Icarus. The original score was transcribed for String Quartet and Voice. The Voice and Cello part. For the purposes of the scene both voice and cello parts were digitally recorded and edited in a Digital Audio Workstation environment. Recordings were finally mixed with the original soundtrack. The background sets presented at the middle of the scene, were painted by a 4th-grade High-School student Vassiliki Raftopoulou from the 2nd Lyceum of Gerakas (2nd Upper High School of Gerakas) under the guidance of her Physics teacher Ms Persefoni Bali. Second Lyceum of Gerakas was the 1st Prize winner for Best Stage-Sets at the "Learning Science Through Theatre" theatrical-group contest (May 2015). The idea of using the human voice for this particular composition is to enhance the idea of developing a series of experiments in analysing its acoustic properties in parallel of the string. In a series of brief musical compositions the sense of composing music according to the properties of a student voice spectrograph is expected to encourage the seeking of similarities between acoustical properties and mathematical or physics representations. Mrs Bulakou, along with Mr Petros Stergiopoulos who composed the music for the "Formation of Stars", is willing to further develop the possibilities of using the human voice as a means to encourage students in exploring artistic properties related to science, visual arts and drama. The Greek "skyscene" was performed by student Antonis Kontopoulos who undertook the responsibility of preparing a triple task for the Greek participation in the Skylight scene. The student played both characters of the scene ("Joao" and his "Father") but also as a Cello student himself, he recorded the Cello part which supported the scene. The final video of the "Formation of Stars" included screen-shots from the recorded online-multicast sessions of "Ikareia Thymaina" a brief distributed event that took place between Athens, Gavdos, Thymaina and Polykarpi. 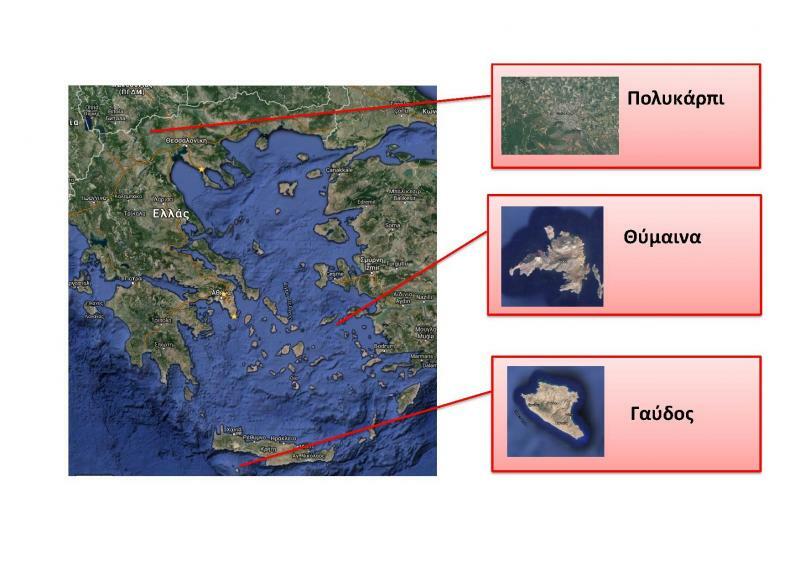 Primary schools of Gavdos, an island at the southest part of Europe, and of Thymaina, a tiny island at the Icarian Sea, participated at the performance and representation of the Myth of Icarus using elements of Physics and Music such as heat and rhythm. In Thymaina, teacher Stefanos Poultsakis developed a representation of the ancient local myth of Icarus as a visual-drama event including action-response to distant audio-performace according to a "Link-scenario". In Gavdos, teacher Sofia Siatravani guided her pupils to create colour-sheets and make them part of an audio-response-distributed-videoconference-event according to the same above "Link-scenario". Dr. K. Boulakou revised a simplified text-version of the myth while in Polykarpi, a remote Primary school at the northern of Greece, pupils performed experiment-enhanced presentations of the myth with heat and light including distrubuted narrations and audio-response between Athens and Thymaina (find more on the "Ικάρεια Θύμαινα" community). Following the experience of the activity above, a network of schools (Global Science Opera in Real Time) is now being built supporting remote and rural teachers that wish to be engaged in exploring innovative strategies for Science Teaching. The network will develop distant collaboration teaching methods through performance arts using adaptive videoconference environments.